Moments ago I read that Fred Phelps and his “church” are planning to picket the funerals of those killed in last Saturday’s massacre in Tucson AZ. Included in these pickets is the funeral for Christina Greene, the little 9-year-old girl who was murdered. I want to make something abundantly clear in this post. Fred Phelps and his followers and his church are anti-christ. Their actions, their pious ” holier than thou” arrogance is in no way representative of Christ or His Gospel of peace and grace. His protests and his words are another gospel, an evil, perverted, and “smells like the smoke of hell” gospel. He preaches hate, he is nothing more than a fancy mausoleum full of dead men’s bones. He is a pariah in the world of Christendom. To the family of Christina and to the other families I want to express my deepest apology for the hurt and pain that may be added to the great and heart-wrenching sorrow you are already experiencing. I weep with you in your pain and I pray that Christ may give you incredible comfort and peace at this time. To F. Phelps and company…may God have mercy on your blackened hearts and souls. You have and continue to cause great pain to grieving people. You do not exemplify the gospel, you destroy its message with your evil words. Turn to the mercy of Christ before it is too late for you all. To the church…we need to become more loving, more gracious, more merciful, and more like the One who went to the cross for us. Pray for a new reformation of grace so that we can offer hope rather than judgement. I take no stand regarding a pointing finger. People do what they do regardless of our opinion. And I’m not at all suggesting that your post was wrong. The Church will uphold the fullness of Jesus. In that I agree. But there is a more pressing problem, other than what a few do to get press. All people who act contrary to the teachings of Jesus are anti-Christ. This is the direction of my blog. We are put in proper state when we remember the Apostle Paul mentioning that there are many who walk contrary to the rule of Jesus and thus are become enemies of the Cross of Christ. And he mentioned that in tears. For they thought they were saved, but will find themselves on the wrong end of God’s Holy Throne. What’s in the news today will be history. And there were thousands of years before it became news. What’s in the heart will be fuel for the fire, or redemption by obedience to Love. Again, I’m not arguing any point but that of the urgency of every man, woman, and child to turn to the Lord with their entire being. This is the engine which will limit what we see in the news today. I’ll leave the pointing to others. I had been thinking about the WBC and how they would interpret someone firing into one of their protests killing several of their members. Would they see it as a condemnation of their actions or beliefs, or would they still blame America and other sinners? Can anyone show in Scripture where yelling at someone they are going to hell or picketing someone lead to a change of life and conversion? Jonathan Edwards preached hellfire messages which lead to mass conversions. Unfortunately, WBC has no tact, their message isn’t technically biblically wrong, but they present it in a way which will elicit no converts. Yes I have read Edwards’ sermon but he doesn’t simply tell people they are going to hell. He offered Christ and salvation to the people. My example for my life is not Edwards though, it is Christ. Though he speaks of hell, he never directly tells anyone they are going to hell. Off the top of my head I recall Matthew 25 as a parable for those who thought they were serving God but weren’t because they were ignoring the poor, imprisoned, and sick. It seems his harshest word for those who believed they knew God. These people literally turned my stomach. It’s people like that , that really do give Christians a really bad name. Truly, it makes me sick. I really don’t care what people believe as far as politics. But we’re talking about other peoples’ lives here. I feel so very sorry for all the families and friends affected by this senseless heartless event (the massacre). 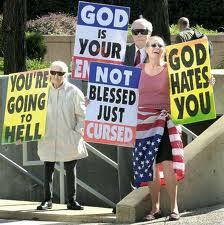 And then to top it off, these sickos who call themselves Christians.